Marble? Granite? Quartz? Natural stone or engineered? What does it all mean? Anyone who has built a home or done a kitchen remodel knows the number of different material options can be overwhelming. And it’s an important decision. Experts estimate you should plan on spending 10 to 15 percent of your kitchen budget on your countertops. Here are some thoughts on different types of materials so you can choose what’s right for you and your home. All prices mentioned are general estimates. 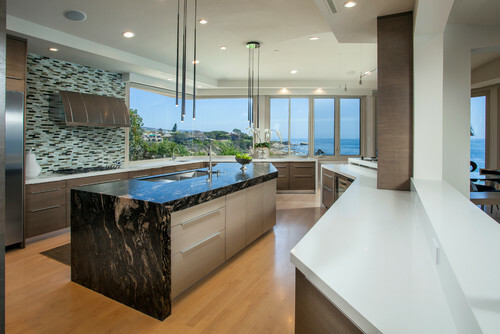 Granite is the number one countertop material for a reason. It’s beauty and durability make it a wonderful choice for almost any kitchen. It’s very nature makes it resistant to water and heat. That being said it is slightly porous. Most granites don’t need to be sealed, though it never hurts and will help block stains and liquids from eventually seeping into the stone. Granite’s inherent strength will also help protect it from scratches and etching. Because granite is a natural material there will be variation from slab to slab. While many people love the uniqueness this ensures, it can make matching up slabs difficult. Expect to spend between $40 and $200 per foot installed. 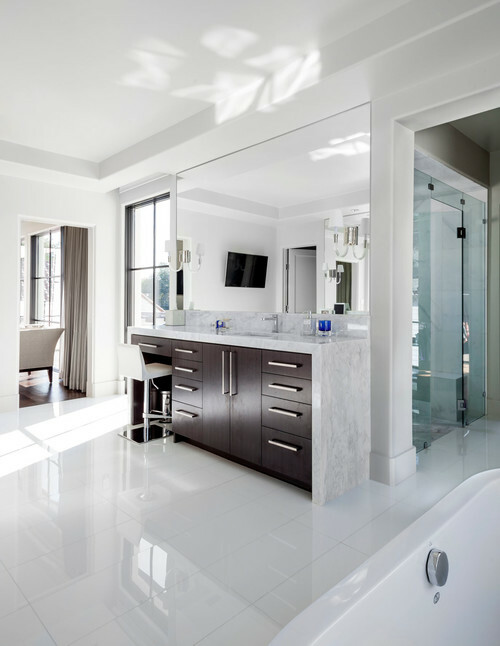 The demand for marble has certainly increased in the past few years. 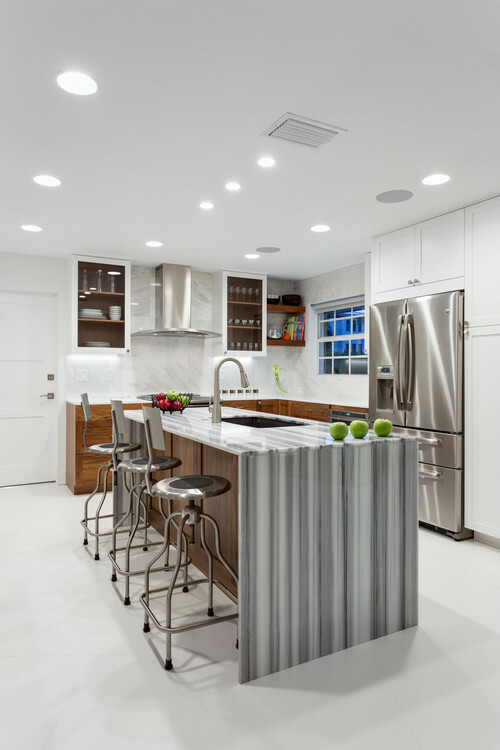 While a lot of marbles have gray veining running throughout, if you’re looking for a bright, more pure white slab, marble is definitely for you. It gives a high end, classic feeling to any space. Marble is more porous than granite and does require sealing; this means it does stain more easily than granite and some other natural stones. It’s also a softer stone, meaning it more readily scratches and nicks. 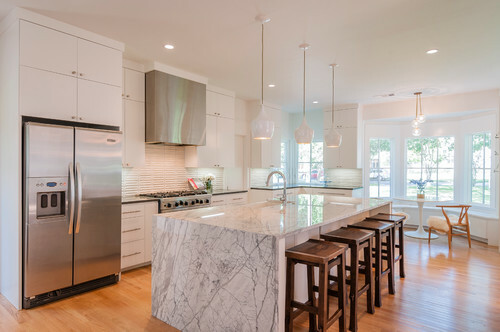 While some marbles like Calacatta and Carrara are decidedly more expensive, there are plenty of options with a price point comparable to granite. Expect to spend between $50 and $200 per foot installed. 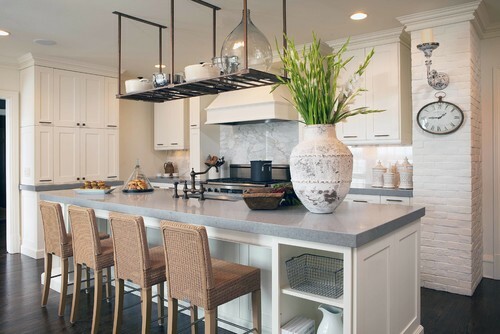 Quartz countertops are growing in popularity thanks to their many good qualities, and due to the fact they don’t have many of the weaknesses of natural stone. Quartz is a manufactured product and is also referred to as engineered stone. The manufacturing process for Quartz allows for an almost unlimited range of colors and can be finished in a luxurious way other solid surface materials aren’t. Quartz is just as durable as stone but more forgiving, so it won’t chip or scratch easily. It’s also nonporous, so it resists staining and will not harbor bacteria or viruses. Quartz doesn’t have many downsides, though it isn’t as heat resistant as natural stone. It may be considered on the more expensive side, though it’s pricing is competitive with many natural stones. If you’re wanting a nontraditional countertop color, quartz might be just what your looking for. Soapstone is a natural material that has been used as countertops for literally hundreds of years. Today people love soapstone for its warm, rustic charm. Soapstone ranges from light to dark gray; the darkest slabs are almost black. Soapstone actually contains a certain amount of talc, which accounts for its milky look and somewhat powdery feel. This also accounts for the softness of the stone, but doesn’t mean it can’t stand up to daily kitchen use. Soapstone is nonporous so it is stain and acid resistant, though it does darken over time. It is recommended you treat soapstone with mineral oil to help achieve a more even look and deepen the color. It’s softness does make it slightly vulnerable to scratching, the mineral oil will help disguise these. Soapstone is extremely heat and bacteria resistant, making it a wonderful choice for any kitchen. Expect to spend between $75 and $150 per square foot installed. 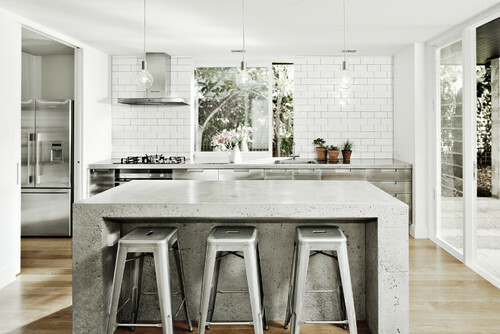 Limestone is a beautiful choice, but not always practical for a busy kitchen. Limestone is an extremely versatile stone, available in a variety of colors and textures. Only the harder, denser varieties should be installed in the kitchen. Your fabricator should be able to help you choose the appropriate slab for your needs, should you choose limestone. Limestone is a calcium-based rock and by its very nature reacts with acidic substances in a manner that can create etching. It’s extremely porous and should be sealed regularly to help minimize staining, as it will soak up liquids quickly. Due to its softness, limestone also scratches and chips more easily than other natural stones. You also need to protect your limestone countertops from heat as it does have the ability to burn. Expect to spend $50 to $100 per square foot installed. Limestone looks great in almost any setting, though it requires a lot of maintenance. 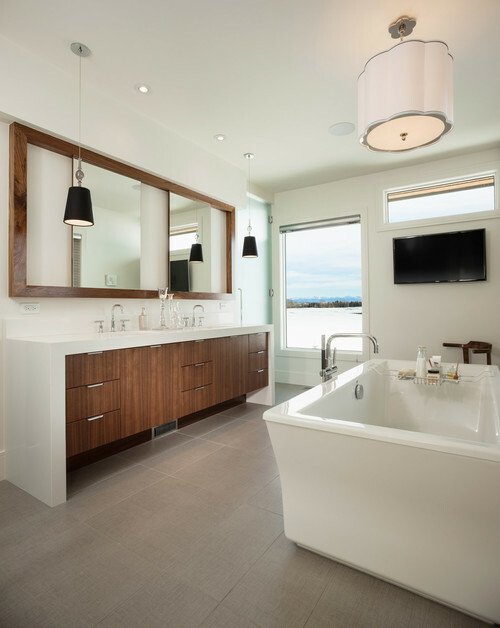 Many homeowners who want limestone choose to use it in a bathroom as opposed to the kitchen. Whatever countertop material you ultimately choose, Prestige Marble & Granite is here to help you with a vast selection of unique, exotic and rare natural stones from around the world. Our knowledgeable staff will guide you through selection, layout, design and installation. We welcome homeowners, designers, and contractors to browse our showroom any time! 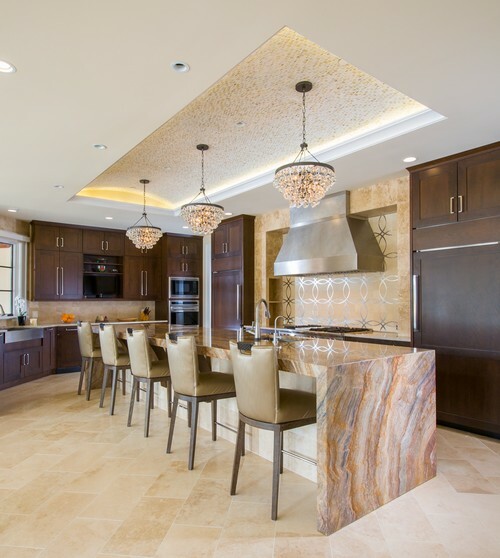 Here at Prestige Marble & Granite, we’re proud to offer the best and most beautiful natural stones available for any of your design projects. We search the world for the best quality stone, with the most attractive coloration and patterning. From classic colors to the exotic and rare, we’re able to offer our customers vast selections to suit any decorating style, personal taste, and budget. Here’s a look at some of our latest acquisitions. Keep in mind that its nearly impossible for a picture to capture the true colors and beauty of the stones, and patterns within a color will vary from slab to slab. We always invite you to visit our showroom to view these unique stones up close and in person! Alaskan White is a blend of silvery grays and icy whites. It’s a truly beautiful piece of stone with small sparkling flecks. Look closely at the second picture to see the shimmer detail more clearly. 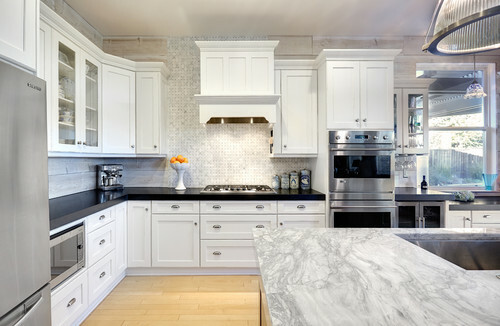 Calacatta is a stunning white quartz with gray veining throughout. One of the benefits of quartz is that its non-porous surface is resistant to staining, guaranteeing your white stays white. Ganashe is an amazing gray granite full of creams, taupe, and black throughout. The exquisite blend of cool tones gives the stone depth while deposits of mineral mica create small areas of shimmer. White Vegas is a beautiful mix of warm tones of both brown and gray. This versatile stone is the perfect match for so many different color schemes and will complement virtually any design style. Quarried in Brazil, White Vienna is a gorgeous white and gray stone with beige and charcoal accents. 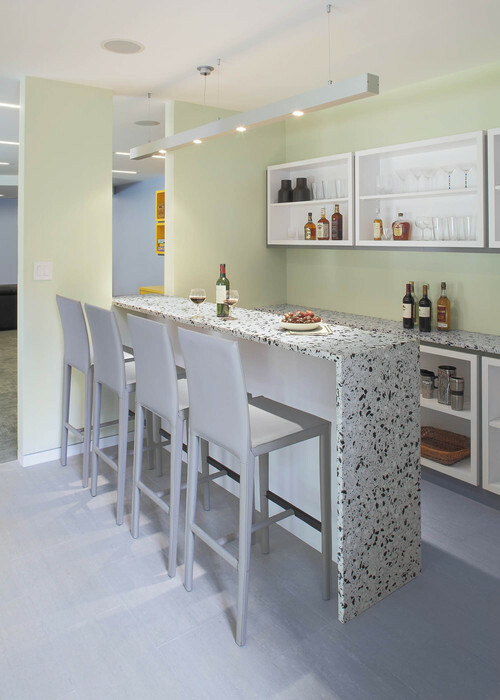 This is a bold granite, guaranteed to make a statement wherever you choose to use it. It’s all in the name. This rock is a gorgeous combination of white and gray with undertones of brown and slight tinges of greens and purples. It somehow manages to be both classic and modern, elegant and easy. This is just a small sampling of what we currently have in house. 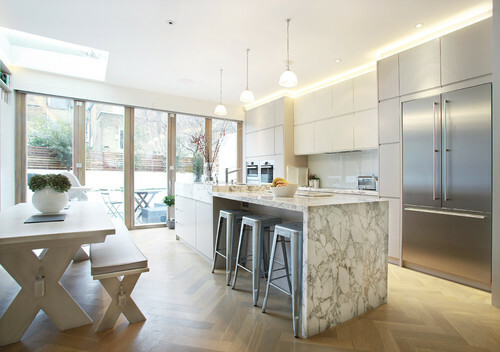 We’d love to show you the full range of options Prestige Marble & Granite has to offer. Whatever your personal taste we are here to help you with a vast selection of unique, exotic and rare natural stones from around the world. Our knowledgeable staff will guide you through selection, layout, design and installation. We welcome homeowners, designers, and contractors to browse our showroom any time! Waterfall countertops have been rising in popularity recently, and we have to admit we love them (when they are installed properly!). 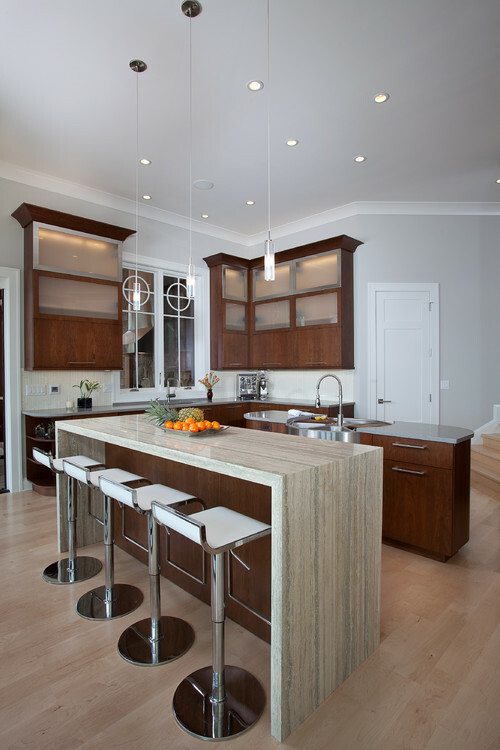 A waterfall countertop ‘falls’ off the edge of a set of cabinets, creating the appearance of a continuous surface that blends from the top surface down the side. While the look is mostly a style choice, there are actually some practical reasons for installing them. End panels on typical wood islands and cabinets are usually high located in traffic areas, making them susceptible to scuffs, scratches and dings. Natural stone sides will withstand the abuse, keeping your island and cabinets looking pretty and new. The waterfall can be used to hide appliances or create hidden storage space for any number of items. Waterfall counters aren’t exclusive to the kitchen. They can be integrated on bathroom cabinetry to cover and protect against water damage and splashing. 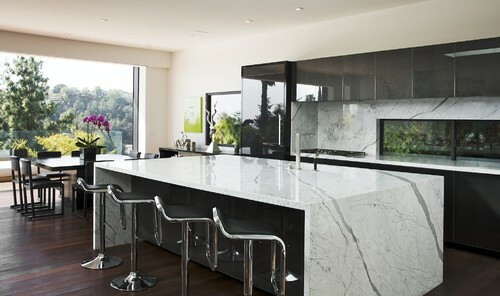 What better way to create a gorgeous, yet practical focal point in your home than with a sleek waterfall countertop? And whatever your personal design preference –traditional, rustic, modern, European, or farmhouse – waterfalls offer a truly distinct accent to any space. Here’s a look at few of our favorites for inspiration. Photo by Wolf Custom Homes Ltd.
Photo by SchappacherWhite Architecture D.P.C. 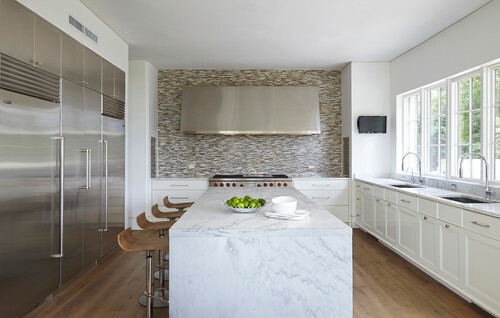 Get even more waterfall countertop inspiration our Pinterest board! We hope you have enjoyed this look at waterfall countertops fashioned from a variety of naturals stones in a myriad of styles. If you’re thinking of taking the waterfall plunge, you can be assured that the natural stone pros at Prestige Marble & Granite have the knowledge and experience to fabricate and install perfectly mitered waterfalls with a seamless appearance. Come browse our Columbia showroom and see for yourself! 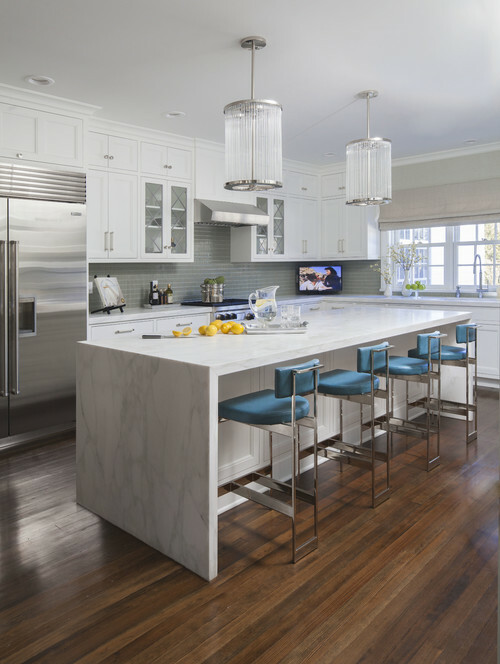 Quartz vs Quartzite: What’s the Difference? The terms quartz and quartzite can be confusing because they are often used interchangeably. While quartz and quartzite both contain the mineral quartz as a raw material source, the two stones are not the same. So what’s the difference? Quartzite is a common material formed in the crust of the earth. This natural stone originated as sandstone and was transformed into quartzite when the spaces between the sandstone were filled with the mineral quartz and then fused together under extreme heat and pressure. Quartzite is very hard, but like marble, granite and other natural stones, it must be sealed for protection against wine, acidic foods, coffee or other common foods that can also etch or stain. As a natural material, quartzite will have variation, with each slab containing a unique spread of color and sparkle throughout. The most sought after quartzite originates in Brazil and India, with the difference in price for the material reflected by availability and location. Quartzite is typically more expensive than the engineered stone, and it’s more difficult to work with, so make sure the fabricator that you are working with has experience with Quartzite. Quartz is an engineered stone, a combination of nature and technology. Resins, polymers, and sometimes pigments or even pieces of glass, are added to crushed quartz to result in a sparkling stone well suited for countertops. This composition material tends to be a bit stronger than quartzite and is not likely to etch. It can also withstand high temperatures, up to about 300 degrees F.
Because quartz is manmade, the color and sparkle will be will be more uniform; quartzite has a more natural look when compared side by side to quartz. 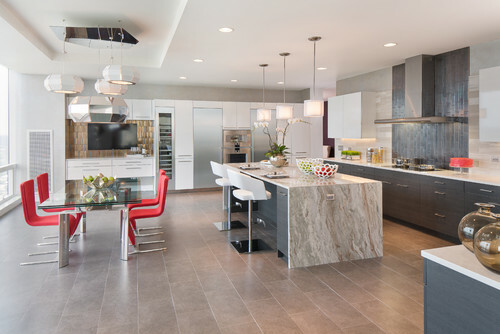 While quartz and quartzite are not the same, both are beautiful and durable. Natural beauty or manufactured consistency? It’s up to you! Prestige Marble and Granite offers both Quartz and Quartzite, in addition to many other beautiful stone varieties. Whatever stone you choose, rest assured our experienced fabricators can handle the job!